Author Will Tuttle answered questions following a free screening of a "A Prayer for Compassion" on Tuesday in Dallas. Photos courtesy of the author. A nationally known animal advocate was in Dallas last night to shed light on his prescription for "The World Peace Diet," the title of his 2016 book. 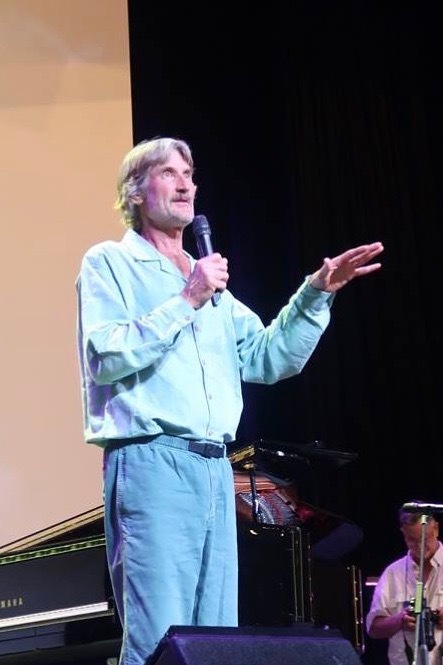 That we really can treat each other better, extend our compassion to all living beings and feel awesome physically and spiritually is the message of Will Tuttle, who is also a writer, musician and peace proponent. Dr. Tuttle answered questions from the audience following a film screening of A Prayer for Compassion at Unity of Dallas in Dallas. Dr. Will Tuttle spoke at Unity of Dallas last night. Courtesy of PlantBasedDFW.org. Dr. Tuttle is a former Zen monk with a Ph. D. from U.C. Berkeley; his presentations focus on compassion, creativity, social justice, animal liberation and a world without conflict or exploitation. His book The World Peace Diet has sold hundreds of thousands of copies since it was first published in 2005. 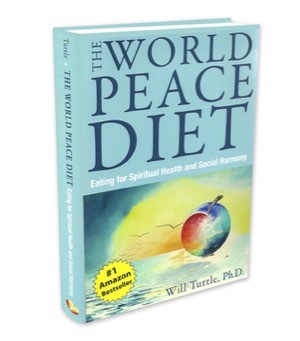 Through The World Peace Diet, Dr. Tuttle sets forth the case that food is our most intimate way to connect to the natural world, and as such, what we eat affects us in subtle, subconscious ways that color our attitudes toward everything from our fellow man to the earth itself, along with the animals that that inhabit the planet with us. To Tuttle, the world’s religions present a latent foundation for spiritual communities to enlarge their reach of compassion to animals as well as humans - in fact our evolution into a peaceful species depends on our embracing animals as individual sentient beings, not food, who deserve to live free from harm and exploitation. The newly released film A Prayer for Compassion, which screened at the event last night, is a documentary that takes viewers around the world in an attempt to answer the questions: "Can compassion grow to include all beings? Can people who identify as religious or spiritual come to embrace the call to include all human and nonhuman beings in our circle of respect and caring and love?" Dr. Tuttle is featured in the film. Unraveling insights from a variety of religious traditions, from Christianity and Islam to Buddhism, Hinduism, Native American beliefs and other sources, the film attempts to lay out a vision for including all living creatures in the circle of our compassion and care. The screening was hosted by plant-based nutrition advocate Maya Acosta and vascular surgeon Dr. Rizwan Bukhari, two long-time health and wellness professionals in the Dallas-Fort Worth area. Acosta is certified in plant-based nutrition through eCornell and advises on reversing common diseases through diet and lifestyle changes. She also offers nutrition resources through her website PlantBasedDFW.com. Dr. Bukhari is CEO of North Texas Vascular Center and incorporates plant-based nutrition in his patient lifestyle modification plan to help in disease prevention and recovery. Acosta says the event was specifically focused toward religious leaders and members of spiritual congregations, exploring a broader definition of what it means to practice compassion. “The movie really talks about why religious leaders do not promote compassion towards animals when they promote compassion toward other things,” Acosta says. The event also featured vegan food and concluded with a piano performance by the multi-talented Dr. Tuttle. Acosta says Tuttle’s teaching has illuminated her own understanding and that she wants to share that inspiration with others. She says she’s been especially influenced by Tuttle’s message that the part of every one of us that nurtures and cares for others dies little by little as we dismiss the sanctity of life in other beings and turn them merely into commodities that fill our passing caloric requirements for the day. Acosta says the film lays out the torture that animals raised for food endure, from the moment they’re born to the day they’re pushed onto the slaughterhouse floor to be killed, cut up and packaged into mere products. Whether we know about their plight or remain willfully ignorant, Acosta says the destruction to our fellow beings, the planet and even our own souls is the same.